Since the earliest times, fire represented light in the darkness, warmth in the coldness, it felt “Holy” and had been associated with the Divine. In every sanctuary, temple and shrine, fire is represented through the flame of a candle. Candle Magic is extremely powerful, when I work on your intention, I dress your candle with magical herbs, crystals and oils. Invocation, prayers, chants, psalms and mantras are recited upon your candle, infusing it with powerful life force that will in your favour creating healing, peace and harmony over your situation. Everyday during 7 days in a sacred space , I will pray and meditate on your candle and the goals you want to manifest and as the holy flame consumes the candle, all the blocks that had kept you away from your wish is melted away. 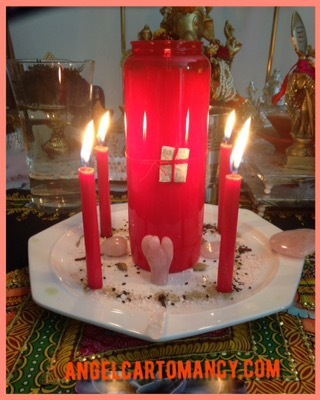 I do offer candle altar service, where I dress and light a candle and pray and work onyour intentions to help you manifest this dream or wish that is dear to your heart. The candle will burn all day long, and working for you. I offer different type of candle work, if you are unsure of what to choose, please feel free to contact me by mail at alexandremusruck@gmail.com Please don’t forget to fill in the contact form at the bottom of the page so I can start your work as quick as possible, if your candle work involves a third party please add his/her name with the person’s date of birth. Write a petition, I will add it to your work. An Oil Lamp produces light continuously for a period of time using an oil-based fuel source, lamps had existed for thousands years even preceding candles. An oil lamp can be used exactly like a candle for the purpose of magical work, where appropriate herbs, minerals and other powerful ingredients are loaded into the lamp.The lamp will even burn more longer than a 7 day candle, a long-lasting way to help in manifesting ones dream. Here at Angel Cartomancy, we offer the service of lighting an oil lamp that will burn for 9 days for a client, each day, I will personally, pray, meditate and work on your intention pray and work on your intentions to help you manifest this dream or wish that is dear to your heart. If you need any details on my lamp work, please contact me at alexandremusruck@gmail.com Please don’t forget to fill in the contact form at the bottom of the page so I can start your work as quick as possible, if your Magical Lamp work involves a third party please add his/her name with the person’s date of birth. Write a petition, I will add it to your work.